Revenue increased the Small Benefit Exemption allowance from €250 to €500 in 2015. This allows a company to give their employees one, tax-free benefit up to the value of €500 each year. Revenue offers an additional tax allowance on Long Service Awards when the awards take the form of tangible gifts. Gift Innovations will advise you on the rewards options and tax-efficient solutions to avail of these allowances. Revenue allows one, small non-cash benefit per employee, per annum, up to the value of €500. (PAYE, PRSI or USC do not need to be applied to the benefit). Only one such benefit may be given to an employee in the tax year. * On the assumption that the small benefit has not previously been used by the employee. 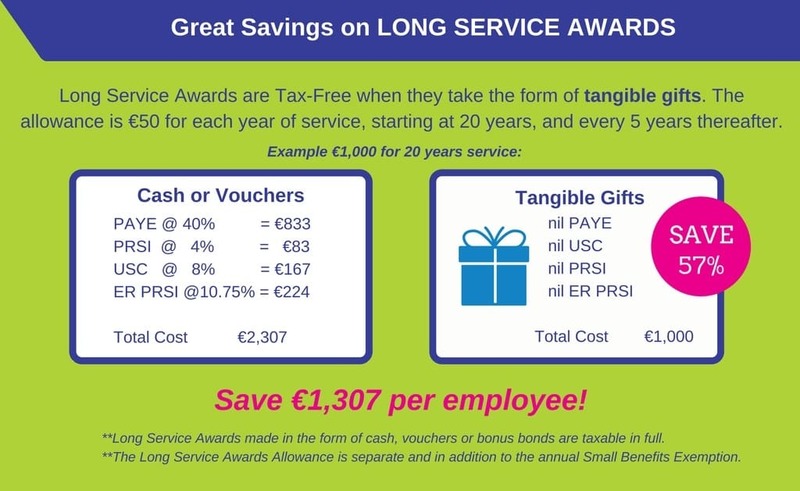 Revenue offers generous tax relief on Long Service Awards only when the awards take the form of tangible gifts. The allowance is €50 for each year of service, starting at 20 years of service, and every 5 years thereafter. * Long service awards (20, 25, 30 & 35 years of service, etc.) are Tax-free only when the awards take the form of tangible gifts.